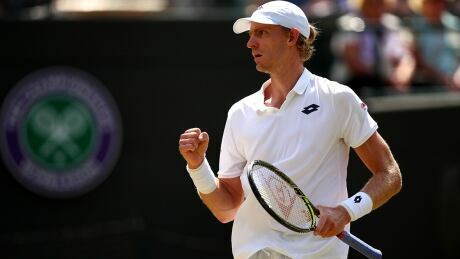 Kevin Anderson produced an astonishing fightback from two sets down to beat eight-time champion Roger Federer 2-6 6-7(5) 7-5 6-4 13-11 in a quarter-final cliffhanger at Wimbledon on Wednesday. The big South African's hopes looked forlorn as Federer skipped through the opening two sets on Court One with his usual panache but he turned the match on its head to cause the biggest shock yet in a tournament full of upsets. It was his first win against Federer at the fifth attempt and means he is the first player representing South Africa to reach the semi-final here since Kevin Curren in 1983. Eighth-seed Anderson, 32, saved a match point in the 10th game of the third set and grew in confidence against an increasingly-ragged Federer who had won the first set in 26 minutes. He won the third set to snap Federer's 34-set winning streak at Wimbledon and Federer was clearly shaken as Anderson dominated the fourth set to drag the 20-times Grand Slam champion into a decider. Federer eventually cracked at 11-11, double-faulting to hand Anderson a break point which he converted when the defending champion hit a weary-looking forehand halfway up the net. Meanwhile, Novak Djokovic shrugged off a second-set slump to reach a Grand Slam semifinal for the first time since 2016 by beating Kei Nishikori 6-3, 3-6, 6-2, 6-2. He next faces two-time champion Rafael Nadal or fifth-seeded Juan Martin del Potro in his first Grand Slam semifinal since the 2016 U.S. Open. Nadal won the first set 7-5. Canadian Gabriela Dabrowski is heading to the Wimbledon semifinals in women's doubles. The Ottawa native and partner Yifan Xu of China, the tournament's sixth seeds, defeated the unseeded pair of Bethaine Mattek-Sands of the U.S., and Lucie Safarova of the Czech Republic 5-7, 6-4, 6-2 in a quarterfinal.